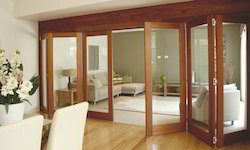 Leading Manufacturer of telescopic sliding wood door systems and wood stacking folding doors systems from Gurgaon. We are offering Telescopic Sliding Wood Door Systems to our clients. Heavy-duty aluminum top track profile ad robust Delrin roller assembly ensures smooth sliding, silent movement, and long-lasting reliability. Toothed timing belt for continuous reliable operation. Options available for simultaneous sliding of three panels in the same direction. The Same system can be used with Aluminium framed panels. SIO Wood Systems are joined together using folding SS hinges complete with hangers running on an aluminum track. The hangers have bearings that are smooth running and maintenance free. The system can be adjusted both laterally and vertically thus allowing for maximum flexibility in site conditions. Bottom drop bolts ensure that the panels remain rigid. A flush guide channel in the floor is required. Ideal for exterior and interior applications at offices and residences.